Don’t let the name of this recipe turn you off. My immediate reaction after reading the name was to squinch up my face in disgust, but I decided to forge on and read the ingredients before making the decision as to whether or not I would try this recipe. I won’t lie, the cooked sliced turkey breast in this recipe just didn’t work for me (in my head) so I decided to omit it from the recipe. Since this calls for a pretty significant amount of spinach, I was also pretty concerned that Tom wasn’t going to eat it at all. But since I’m determined to lose weight, I figure he can either eat what I make, or eat cereal. 1. Preheat oven to 375. Spray a 9×13 baking dish with non-stick cooking spray. 2. In a small bowl, combine ricotta cheese, egg, garlic, oregano, and pepper together. 3. Spread a thin layer of the crushed tomatoes on the bottom of the prepared baking dish, then layer with three lasagna noodles. 4. Add a layer of the ricotta cheese on top, followed by the spinach. Then repeat starting with the crushed tomatoes. 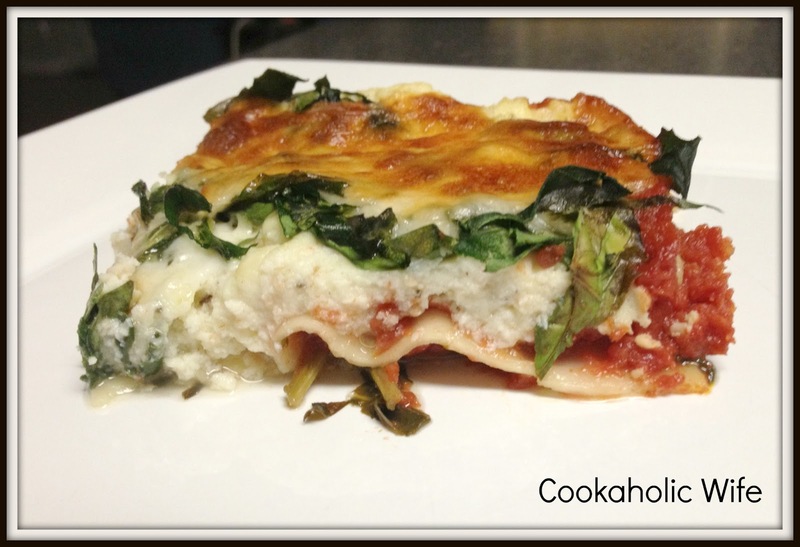 Top the lasagna with the sliced mozzarella cheese. 5. Bake for 45 minutes then let rest for 10 minutes before serving. 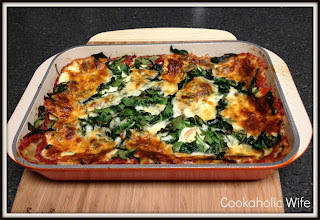 I was completely and utterly shocked when Tom said “Hey honey, this is really good.” I had to ask him if he was being serious or not since there you could easily see all of the spinach in the lasagna. But, he was serious, and I have to agree, for a meatless lasagna, its really filling. I will confess though, the browned mozzarella pieces on the top are my absolute favorite, I could eat that as a meal.